Each year in the United States, emergency departments treat more than 200,000 children ages 14 and younger for playground-related injuries? About 45% of playground-related injuries are severe, resulting in fractures, internal injuries, concussions, dislocations, and amputations? About 75% of non-fatal injuries related to playground equipment occur on public playgrounds? Most occur at schools and daycare centers. Between 1990 and 2000, 147 children ages 14 and younger died from playground-related injuries? 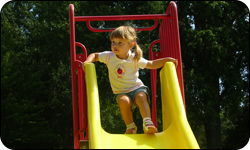 Of them, 82 (56%) died from strangulation and 31 (20%) died from falls to the playground surface. Ensure there is safe surfacing beneath and surrounding all playground equipment in order to minimize the risks of falling. Acceptable loose-fill surfacing materials include shredded rubber, hardwood fiber mulch or chips, and fine sand. Rubber mats, synthetic turf and other artificial materials are also safe surfaces and require less maintenance. Avoid asphalt, concrete, grass and soil surfaces under playground equipment. They are not good at preventing injuries. Ensure that all playgrounds are inspected and maintained by qualified personnel. Daily, monthly and annual maintenance schedules should be followed. Maintain separate play areas for children under age 5. Ensure that schools and childcare centers have age-appropriate, well-maintained playground equipment and that trained supervisors are present at all times when children are on the playground. Report any playground safety hazards to the organization responsible for the site (e.g., school, park authority, city council). Always supervise children using playground equipment. Stay where you can see and hear them. Prevent unsafe behaviors like pushing, shoving, crowding and inappropriate use of equipment. Remove hood and neck drawstrings from all children's outerwear. Never allow children to wear helmets, necklaces, purses, scarves or clothing with drawstrings while on playgrounds.